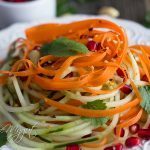 This Easy Thai Cucumber Noodle Salad is tossed in a homemade ginger sesame dressing and garnished with fresh pomegranate seeds, cashews and sesame seeds. It is made with minimal effort and ready in 15 minutes flat! Guaranteed to make you make you feel radiant from the inside out! Gluten free, vegan and Whole30 friendly. 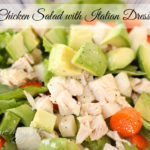 Many of you asked for more quick and easy healthy gluten free meals. I am here to deliver! 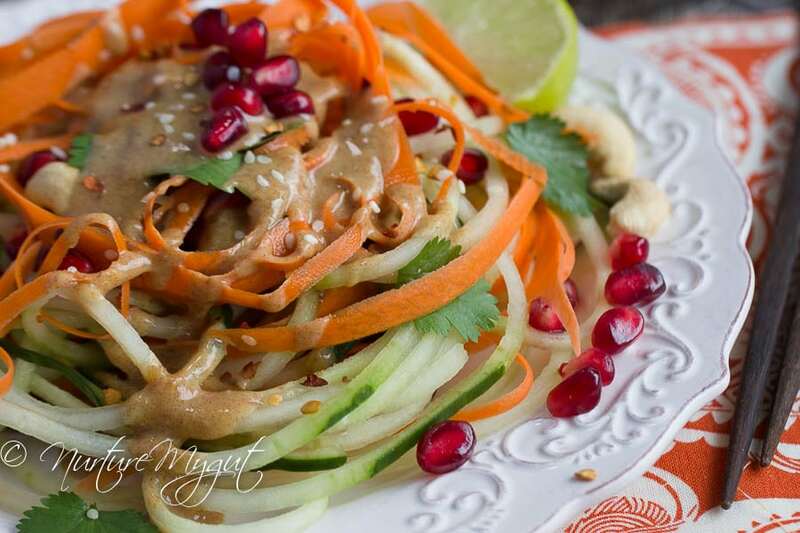 I absolutely am in love with this easy Thai Cucumber Noodle Salad and I know you will too! You know when you eat something and you feel really good after eating it, I mean, really good? Well, that is how this salad makes me feel. 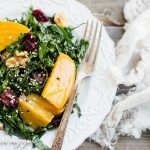 It is like eating a burst of radiant energy thanks to all the raw enzymes, vitamins and phytonutrients that this colorful raw meal provides our bodies. Cucumbers contain multiple B Vitamins. B Vitamins are known for supporting the nervous system and easing the effects of anxiety and stress. They may also help to “cool” the inflammatory response in your body. Studies suggest that cucumber extract helps reduce unwanted inflammation, in part by inhibiting the activity of pro-inflammatory enzymes. (Mercola) This has been my go to food during unwanted eczema breakouts. Cucumbers also support a healthy digestion since their skins contain insoluble fiber which helps food move more smoothly through your digestive tract. A lack of fiber in the diet is a huge contributor to constipation. 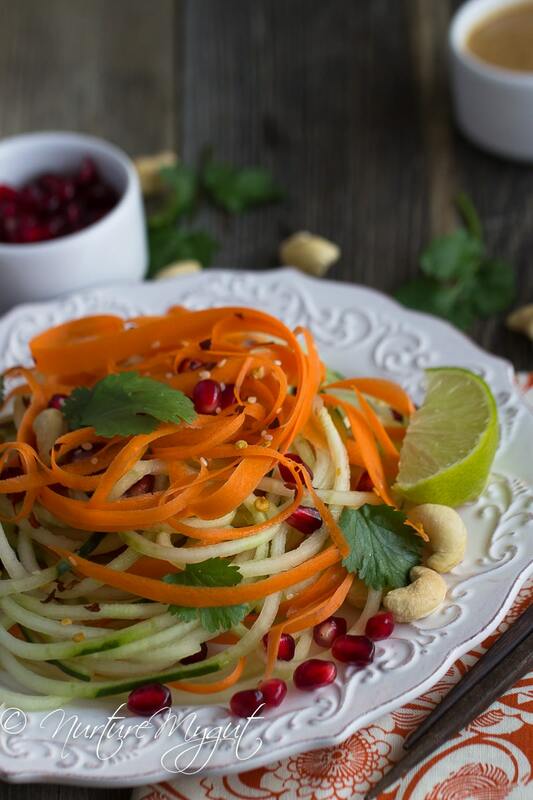 So basically, eating cucumber noodle salad is not only delicious, but really good for you! 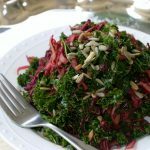 What I love about this salad is that it is absolutely lovely to look at! You must serve this when having guests over! 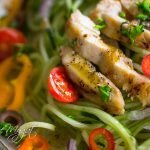 They will think that you slaved in the kitchen for hours, but between you and me, you can whip this Thai Cucumber Noodle Salad up in 15 minutes or less! The cucumber noodles are so easy to make, trust me on this one. I use a vegetable spiralizer with the smallest opening to make the cucumber noodles. I just chop of the ends of the cucumbers and put them into the spiralizer, turn the crank and out pops the cucumber noodles! They literally take about 20 seconds to make. Yes, I am serious! Below I share how easy it is to make cucumber noodles. 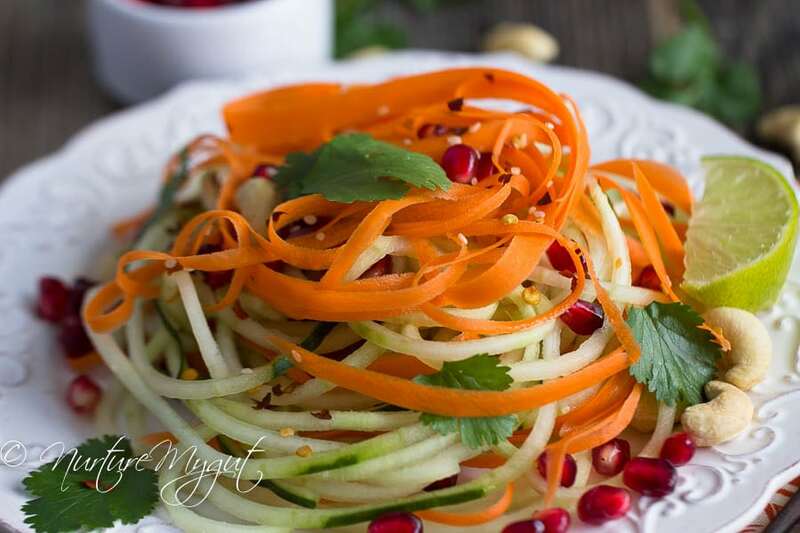 To make the carrot ribbons, I used a Y-shaped vegetable peeler to add a variety of texture into the salad, but you can also spiralize the carrots with the vegetable spiralizer too! To make the Thai dressing, I use a mini food processor. I added sesame oil, dates, garlic, water, lime juice, lime zest, ginger, gluten free Tamari, Dijon mustard, red pepper flakes and salt. Feel free to replace the Tamari with coconut aminos if you are on a Whole30 cleanse. To make this a balanced Whole30 meal, I would recommend serving this with Cast Iron Grilled Chicken and some sliced avocado. For more healthy gluten free, paleo friendly recipes, be sure to subscribe below! Plus, you will get my free Paleo Breakfast recipe e-book as my gift to you! In a food processor, blend together sesame oil, dates, garlic, water, lime juice, lime zest, ginger, coconut aminos or Tamari, mustard, salt and red pepper flakes. Blend until smooth and creamy, about 1 minute. 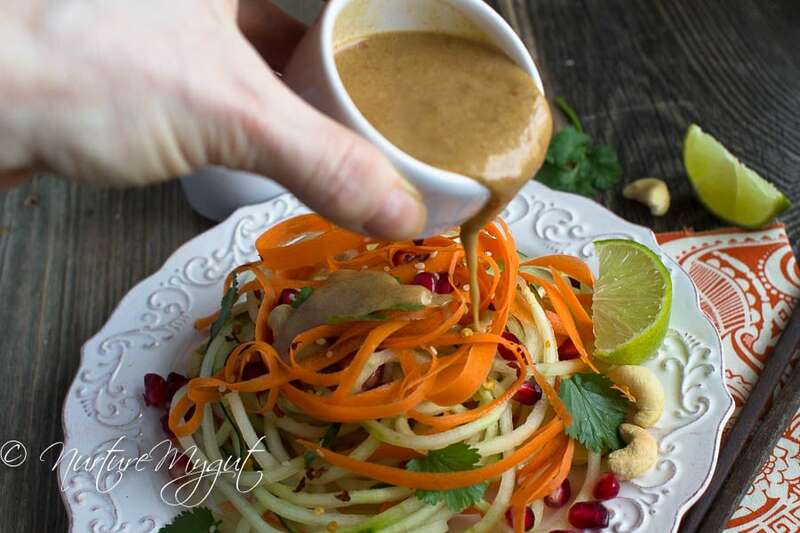 Pour Thai dressing into a jar and set aside. Makes just under 1/2 cup dressing. 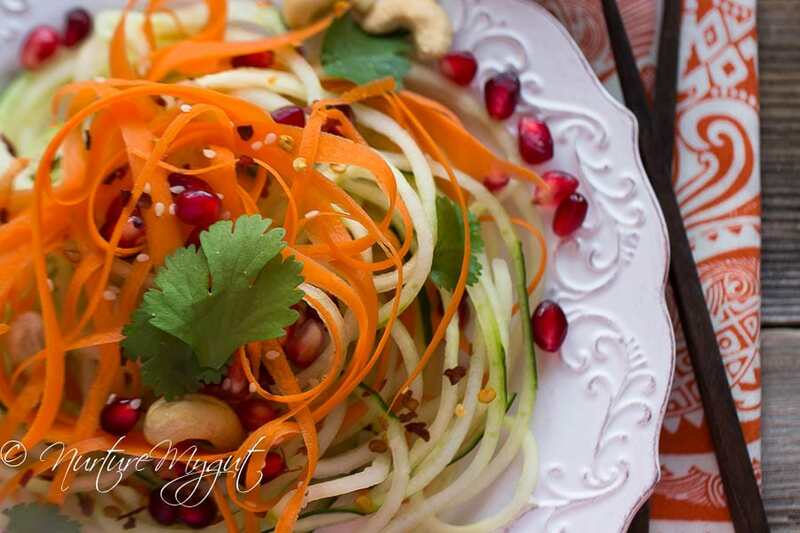 For salad, spiralize cucumber noodles with a vegetable Spiralizer, I use this one. Arrange cucumber noodles on plates. This will make 2 large servings or 4 small servings. Make carrot ribbons with a vegetable peeler, divide carrot ribbons among plates. 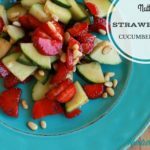 Top each cucumber salad with a drizzle of Thai dressing. 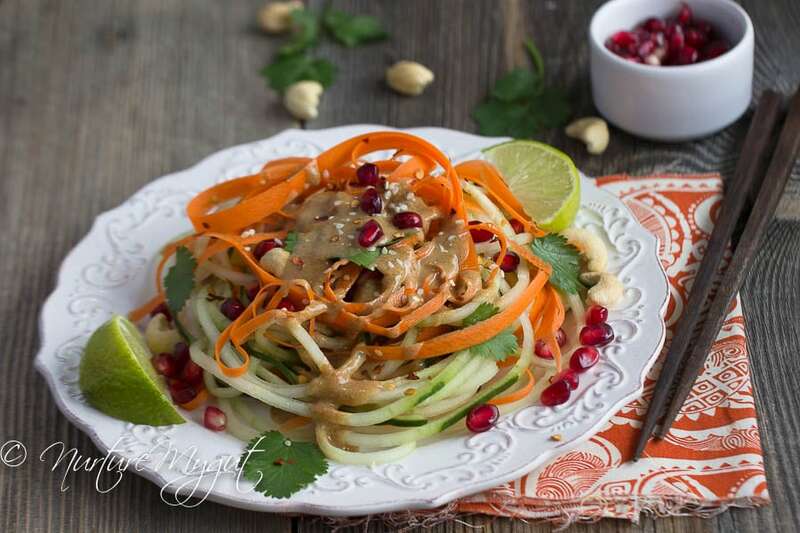 Top each salad with pomegranate seeds, fresh cilantro, cashews and sesame seeds. Serve each salad with a lime wedge. Nutritional data below includes 2 Tablespoons dressing per serving. I made this with just the cucumbers, carrots, cashews and dressing. Didn’t use the centre of the cucumber, and didn’t have a lime zest so used no water and all lime juice. It was great. My 1.5 year old with only one tooth was happy to eat it as well. I will print this one off. Thanks. Great way to get through some cucumber bounty in the garden. 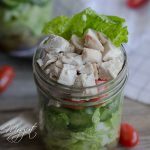 Were the cashews added to the dressing? This salad looks so pretty! I’m all about simple and healthy, and that Thai dressing sounds delicious. ?